Kimchi (or kimchee) is loaded with vitamins A, B, and C, but its biggest benefit may be in its “healthy bacteria” called lactobacilli, found in fermented foods like kimchi and yogurt. This good bacteria helps with digestion, plus it seems to help stop and even prevent yeast infections, according to a recent study. And more good news: Some studies show fermented cabbage has compounds that may prevent the growth of cancer. This is horrible news for Kelly. If you’ve never experienced kimchi in the flesh, it stinks, and it looks like the Syracuse mascot barfed in a jar and let it ferment for a couple of decades. So even though Kelly thinks it tastes alright, she just can’t get past the smell. It’s always a struggle to get her to buy it for me. Lately, I’ve had to resort to bargaining. I’m now down to one kidney and 1/2 a lung. And whomever was the recipient of my duodenum, you’d better enjoy it. I miss you, Duod. You were always like an intestinal tube to me. 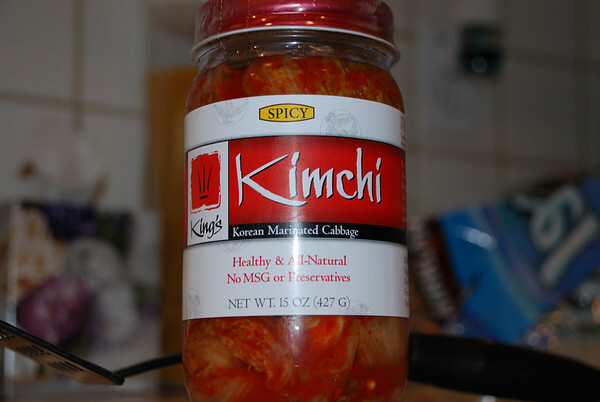 But back to my point, I love kimchi, and I now have a valid excuse for eating it, stink and all. This entry was posted in Blog and tagged good-eats, us on April 27, 2007 by Jon Sagara.